For other people named Arthur Read, see Arthur Read (disambiguation). Arthur Timothy Read is the titular protagonist of both the book series and the PBS children's television show Arthur, created by Marc Brown. On the show, he is an eight year old anthropomorphic aardvark in Mr. Ratburn's third grade class, and lives in Elwood City. Arthur is an anthropomorphic aardvark. In Brown's first Arthur book, Arthur's Nose (1976), Arthur is shown with a long nose and resembles an actual aardvark, though as the books progressed and eventually became a TV series, a noticeable, simplified version of Arthur took shape. The character's most recognizable form is a light brown, slanted face with small ears, drawn as a bipedal, pre-pubescent youth with signature round glasses. On more than one occasion, Arthur's classmates tease him for his glasses and somewhat "dorky" attire. Boston Children's Museum displays an inflatable Arthur on the roof, weather permitting, to advertise the "Arthur and Friends" exhibit within. The tensions between Arthur and his 4-year-old sister Dora Winifred "D.W." Read are a common theme in the Arthur series. Arthur is constantly pestered by his four-year-old younger sister D.W. She usually tries to get Arthur into trouble, although Arthur sometimes retaliates. Despite that, Arthur tries his best to ignore D.W.'s annoying antics most of the time and often does her favors—sometimes at his parents' request and against his will. D.W. also make frequent attempts to hang out with Arthur's friends, who relent in later episodes. Arthur's parents are his mother, Jane Read, who is a work-at-home accountant, and his father, David L. Read, who runs a catering business. His mother is from the Pittsburgh area and knew Fred Rogers as a child, while most of his father's relatives are from Ohio. He also has a baby sister named Kate and a pet dog named Pal. Appearances from Arthur's extended family include Grandma Thora (David's mother), Grandpa Dave (Jane's father), Uncle Fred (Jane's brother), Uncle Richard, Uncle Bud, Uncle Sean, Aunt Jessica, Aunt Loretta, Aunt Lucy, and his cousins Cora, Monique, Ricky, George, and other unnamed relatives. However, the only two members of Arthur's extended family who have appeared more than once as of today are Grandma Thora and Grandpa Dave. Grandma Thora lives in a house not too far from Arthur's in Elwood City and is known to be a bad cook, but a loving grandmother and a world-class marbles player. She loves to play bingo every Friday night, and in some episodes has to watch over Arthur and D.W. She is good friends with Mrs. McGrady, the school cafeteria monitor. Grandpa Dave lives on a farm he claims has been in the family for 150 years. Buster Baxter is regarded as Arthur's best friend who has the habit of eating yummy junk foods. Muffy is popular and rich due to her dad's successful used automobile business, Crosswire Motors. Not to be confused with The Brain from Pinky and the Brain. The Brain's true name is Alan, but his friends call him Brain due to his high intelligence and habit of correcting others' mistakes in many subjects. George is a ventriloquist and has a wooden giraffe ventriloquist dummy named Wally. George also has dyslexia, but he doesn't let that get in his way. Binky acts as the main school bully, but he can't intimidate some of the students, especially Sue Ellen. Francine Frensky and Sue Ellen Armstrong are some more of Arthur's friends who appear most frequently. 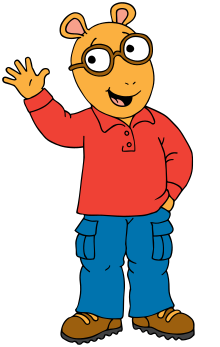 Arthur was originally voiced by Michael Yarmush for the first five seasons from 1996 until 2000 when he reached puberty. In 2001, Yarmush was replaced with Justin Bradley for the 6th Season. Bradley was replaced with Mark Rendall who started voicing Arthur in Season 7. After Season 8 in 2003 Rendall redubbed all of Bradley's dialogue in Season 6. ^ "FAQS ABOUT ARTHUR AND FRIENDS". PBS Parents. ^ "Arthur's Big Hit". Arthur. Season 4. Episode 1. October 5, 1999. ^ "PBS Kids web site". ^ "Arthur's Eyes/Francine's Bad Hair Day". 2 September 1996 – via www.imdb.com.